I live, I die, I live again..
Mario Kart 8 Deluxe for the Nintendo Switch is an extremely fun and enjoyable multiplayer experience. It's a game that you can jump into and almost immediately understand how to play. The pickup and portable nature of the Switch make it an obvious choice when you want to entertain a small group of friends or family. Now, this is a review for Crawl, and you are probably wondering why I am talking about Mario Kart? Well, if it wasn't for Nintendo's widely popular racer, I wouldn't have even discovered this incredible game. Christmas morning, after all the gifts had been opened, I connected my Nintendo Switch to my sister's tv. I opened my travel case and discovered I had accidentally left Mario Kart at home. So, I looked through my available selection for something that we could all play, but alas; all single player games. I was frustrated. I connected my Switch to the local wifi and browsed the eshop store and there it was, Crawl. I checked out a few screenshots and discovered it was a multiplayer hack and slash dungeon crawler with a twist. You will start as a human hero, trapped in a room with up to three other players. The catch? Only one of you can live. Each defeated player will become a spirit and this will allow you to possess objects, traps, and summon a variety of deadly monsters. Should you defeat the hero in combat then you will regain back your humanity and the previous hero will join in with the remaining spirits in a hope that they too can regain their humanity back. It is a vicious cycle that can put a smile on your face when you've discovered in a flash of blood and spectacle that it was your killing blow that fell the hero. The combat and movement of the game is incredibly fast and fluid. You'll wield swords, battle axes, spears, bows, and a magic staff, among a slew of other weapons. You can also equip various items to give your character a dodge roll, emit a dangerous putrid sludge, or throw out barrages of deadly cyclones. Much of the appeal of Crawl comes from its pixel art graphics that pay homage to a much older generation of games, a genre that is seeing unbelievable growth in the indie market. Crawl has some fantastic creature designs and the old school Zelda-like dungeons make it a match made in heaven, even if the aesthetic of the dungeons doesn't change. The game also features several wonderfully animated bosses that all look and play extremely satisfying and can make for some epic confrontations. While you can play with AI-controlled competition, Crawl is truly intended to be a 'friends on a couch' experience, becoming a near perfect game with the right group of people. I've played this with groups of all ages and it was a blast each and every time. Much like Mario Kart, this is a game that you can pick up and play almost immediately. As the hero, you will strike down the player controlled monsters that come your way and avoid traps and flung objects that will attempt to cut down your health. When you kill other player's monsters or open the various chests around the room, you'll earn gold. Each floor of the dungeon has a shop that contains various weapons and items that will boost your stats or change aspects of your hero. As a spirit, every single room is a delicious playground of opportunity. Flame traps, barrels, hell, even a chair, can and will be used as a weapon. You'll also come across pentagrams on the ground that you can use to summon a creature. While playing, you can earn wrath, a currency that allows you to upgrade your monsters between floors. As the spirit, you can also collect ectoplasm that is floating around everywhere. Collect enough of it and you can summon small little blobs that you can take control of or just let loose upon the player, even if they are extremely weak. Before you start a game, you will select a tier of monsters, with each tier getting more and more complex designs and this is where Crawl truly shines. 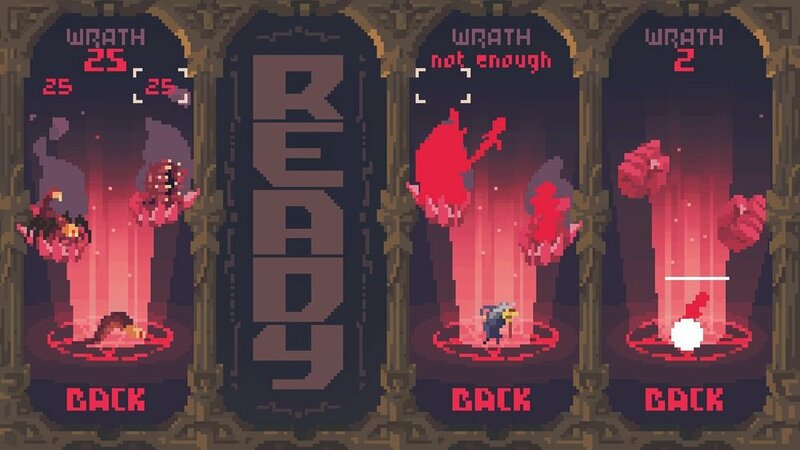 As you collect wrath, it allows you to change the monsters within your current tier. This allows you to try out monsters that you may not have unlocked yet and can make for some incredibly satisfying hero-kills when you have discovered how fun a particular creature can be. The goal of the hero is to reach level 10 and activate a portal. This leads you to a boss that can have elements of its body controlled by other players. While this may sound fun, it can be somewhat frustrating if your couch companions are insistent on spamming certain attacks over and over again. Playing with up to three AI-controlled players can still make for a fun challenge, but the bosses, when controlled by real people, can often feel far too cheap, especially the Cyclops with the overpowered laser beam. Combine that with the dungeons having the same basic look and you have really the only two glaring flaws in the game. Regardless of winning the final level or succumbing to the epic boss challenge, you will be rewarded with new monsters and other various goodies. While I am sure the rewards will eventually stop, a half dozen completions later still offered rewards, and frankly, it made me feel that this game recognized and respected my time, which is an odd feat it seems these days. While Crawl has been out on PC for several years now, Powerhoof has brought the best possible version of the game to the Switch, fixing all manner of issues the game had seen in the past three years. The Switch also allows you to play this game pretty much anywhere, which is another feather in the hardware's cap. There are countless games that just feel better on the Switch because of the pickup and play nature of the console and I'm sure there are far more games down the road to also benefit from this. Crawl was a joy to find and an even bigger one to play, especially with a full group filling up space on the couch alongside you. This is a fast-paced party game draped in the trappings of a pixel hack and slash adventure. There are moments of sheer panic as three other players are trying to take down the sole human hero, who will attempt to escape death at every turn. Crawl's biggest strength lies in its simplicity and how easy it is to jump in and play and have a good time, and at under $20, it is one of the best additions to the Switch you can own. Crawl is such a good game that I may have to make it a Christmas tradition to leave Mario Kart at home again this year, you know, accidentally, of course. crawl WAS PURCHASED BY THE REVIEWER.